A color Doppler ultrasonogram of appendicitis is shown below. Suppurative appendicitis; transverse view, color Doppler ultrasound image. Circumferential colors are observed in the wall of the inflamed appendix (arrows), a strong indicator of acute appendicitis. A diagnosis of acute appendicitis is usually made on the basis of a patient's clinical history in conjunction with physical examination and laboratory studies. Because the surgical aim is to operate early—before appendiceal rupture and peritonitis develop—patients who present with typical findings undergo immediate surgery without radiologic evaluation. However, such imaging is advisable in patients with atypical symptoms, which can occur in infants and small children, the elderly, and young women (see the image below). Atypical presentation of appendicitis in a young woman; computed tomography scan. The patient presented with an elevated white blood cell count and right upper quadrant pain. Left, there is pericholecystic fluid and free fluid in the right paracolic gutter, which is caused by retrocecal appendicitis. Right, the appendix, observed in axial section, has an increased diameter and an enhancing thickened wall. See Appendicitis: Avoiding Pitfalls in Diagnosis, a Critical Images slideshow, to help make an accurate diagnosis. Controversy exists as to whether imaging is required in patients with the classic history and physical findings of acute appendicitis. Opinion varies as to whether these modalities should be performed in all patients with suggested appendicitis or if radiology should be reserved for select patients with atypical or confusing clinical presentations. Appropriateness criteria have been published by the American College of Radiology (ACR) for right lower quadrant pain suggestive of appendicitis. In the appropriateness criteria, ratings of 7 to 9 are considered "usually appropriate." Computed tomography of the abdomen and pelvis with intravenous contrast is rated 8, and CT of the abdomen and pelvis without contrast is rated 7.  .
Graded-compression US of the right lower quadrant (RLQ) has been shown to be a useful examination because of this technique’s safety and high accuracy (approximately 90%) in the diagnosis of acute appendicitis. Advantages of US include lack of radiation exposure, noninvasiveness, short acquisition time, and the potential for diagnosis of other causes of abdominal pain, particularly in the subset of patients who are women of childbearing age. Several authors suggest that US should be the first imaging method used in pregnant women and pediatric patients because x-ray exposure is especially undesirable in these groups. Acute suppurative appendicitis in a 15-year-old boy; contrast-enhanced, fat-suppressed, T1-weighted, spin-echo coronal magnetic resonance image. A markedly enhanced and thickened inflamed appendix (arrows) with pericecal enhancement due to the extent of inflammation is shown. Periappendiceal abscess; contrast-enhanced, fat-suppressed, T1-weighted, spin-echo coronal magnetic resonance image. Fluid collections (long arrows) and a markedly enhanced pericecal area (short arrows) are shown. b = bladder; c = cecum. Acute suppurative appendicitis in a 27-year-old woman; scintigraphy study. Pathologic accumulation of technetium-99m human immunoglobulin on the right iliac fossa is observed at 4 hours. Abdominal radiographs are normal in many patients with acute appendicitis and should not be obtained routinely. An appendicolith is the most specific sign on plain radiographic films, but it is observed in only 10% of patients with appendicitis. Disadvantages of barium enema include a high incidence of nondiagnostic examinations, radiation exposure, insufficient sensitivity, and invasiveness. A significant disadvantage of US is that it is operator dependent. 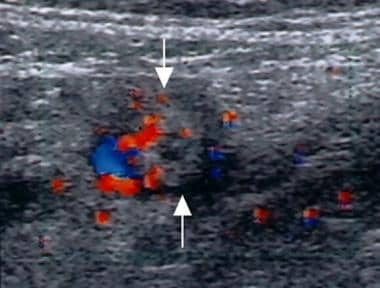 Intestinal peristalsis, pulsations of the iliac artery (when it is close to the appendix), deep respiration in noncooperative patients, and difficulty maintaining the probe at the same location for a long time are disadvantages of color Doppler US in detecting increased vascularity of the appendix. Disadvantages of CT scanning include radiation exposure, the potential for anaphylactoid reaction if intravenous (IV) contrast is used, lengthy preparation time if oral contrast is used, and patient discomfort if rectal contrast is used. Disadvantages of MRI include high cost, use of IV contrast, the requirement that patients fully cooperate, difficulty with patients who are claustrophobic, the inability to observe an appendicolith in the lumen (an important finding in acute appendicitis), and the inability to differentiate between gas and an appendicolith in the perforation site. Disadvantages of radionuclide scanning include long acquisition times (approximately 5 h) and the lack of availability of this modality. For patient education information, see eMedicineHealth's Digestive Disorders Center, as well as Appendicitis, Abdominal Pain in Adults, and Abdominal Pain in Children. [Guideline] Gorter RR, Eker HH, Gorter-Stam MA, et al. Diagnosis and management of acute appendicitis. EAES consensus development conference 2015. Surg Endosc. 2016 Nov. 30 (11):4668-4690. [Medline]. [Guideline] Rosen MP, Ding A, Blake MA, Baker ME, Cash BD, Fidler JL, et al. ACR Appropriateness Criteria® right lower quadrant pain--suspected appendicitis. J Am Coll Radiol. 2011 Nov. 8(11):749-55. [Medline]. [Guideline] Smith MP, Katz DS, Lalani T, Carucci LR, Cash BD, Kim DH, et al. ACR Appropriateness Criteria® Right Lower Quadrant Pain--Suspected Appendicitis. Ultrasound Q. 2015 Jun. 31 (2):85-91. [Medline]. 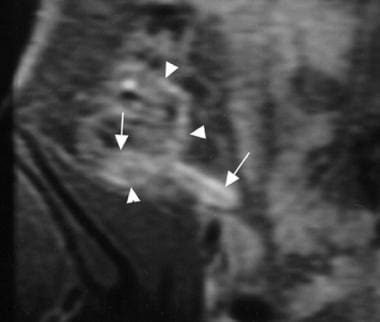 Patel D, Fingard J, Winters S, Low G. Clinical use of MRI for the evaluation of acute appendicitis during pregnancy. Abdom Radiol (NY). 2017 Jul. 42 (7):1857-1863. [Medline]. Shin LK, Jeffrey RB, Berry GJ, Olcott EW. Spectral Doppler Waveforms for Diagnosis of Appendicitis: Potential Utility of Point Peak Systolic Velocity and Resistive Index Values. Radiology. 2017 Jun 5. 162251. [Medline]. Imler D, Keller C, Sivasankar S, Wang NE, Vasanawala S, Bruzoni M, et al. Magnetic Resonance Imaging Versus Ultrasound as the Initial Imaging Modality for Pediatric and Young Adult Patients With Suspected Appendicitis. Acad Emerg Med. 2017 May. 24 (5):569-577. [Medline]. Carpenter JL, Orth RC, Zhang W, Lopez ME, Mangona KL, Guillerman RP. Diagnostic Performance of US for Differentiating Perforated from Nonperforated Pediatric Appendicitis: A Prospective Cohort Study. Radiology. 2017 Mar. 282 (3):835-841. [Medline]. Herliczek TW, Swenson DW, Mayo-Smith WW. Utility of MRI after inconclusive ultrasound in pediatric patients with suspected appendicitis: retrospective review of 60 consecutive patients. AJR Am J Roentgenol. 2013 May. 200(5):969-73. [Medline]. Aydin F, Kin Cengiz A, Güngör F. Tc-99m Labeled HMPAO white Blood Cell Scintigraphy in Pediatric Patients. Mol Imaging Radionucl Ther. 2012 Apr. 21(1):13-8. [Medline]. [Full Text]. Rosenbaum DG, Askin G, Beneck DM, Kovanlikaya A. Differentiating perforated from non-perforated appendicitis on contrast-enhanced magnetic resonance imaging. Pediatr Radiol. 2017 Jun 3. [Medline]. Lyons GR, Renjen P, Askin G, Giambrone AE, Beneck D, Kovanlikaya A. Diagnostic utility of intravenous contrast for MR imaging in pediatric appendicitis. Pediatr Radiol. 2017 Apr. 47 (4):398-403. [Medline]. Didier RA, Hopkins KL, Coakley FV, Krishnaswami S, Spiro DM, Foster BR. Performance characteristics of magnetic resonance imaging without contrast agents or sedation in pediatric appendicitis. Pediatr Radiol. 2017 Jun 19. [Medline]. Jin M, Sanchez TR, Lamba R, Fananapazir G, Corwin MT. Accuracy and Radiation Dose Reduction of Limited-Range CT in the Evaluation of Acute Appendicitis in Pediatric Patients. AJR Am J Roentgenol. 2017 Jun 13. 1-5. [Medline]. Fields MJ, Davis J, Alsup C, Bates A, Au A, Adhikari S, et al. Accuracy of Point of Care Ultrasonography for Diagnosing Acute Appendicitis: A Systematic Review and Meta-Analysis. Acad Emerg Med. 2017 May 2. [Medline]. Yun SJ, Ryu CW, Choi NY, Kim HC, Oh JY, Yang DM. Comparison of Low- and Standard-Dose CT for the Diagnosis of Acute Appendicitis: A Meta-Analysis. AJR Am J Roentgenol. 2017 Mar 16. W1-W10. [Medline]. Sauvain MO, Slankamenac K, Muller MK, Wildi S, Metzger U, Schmid W, et al. Delaying surgery to perform CT scans for suspected appendicitis decreases the rate of negative appendectomies without increasing the rate of perforation nor postoperative complications. Langenbecks Arch Surg. 2016 May 4. [Medline]. Rao PM, Rhea JT, Rao JA, Conn AK. Plain abdominal radiography in clinically suspected appendicitis: diagnostic yield, resource use, and comparison with CT. Am J Emerg Med. 1999 Jul. 17(4):325-8. [Medline]. Whitley S, Sookur P, McLean A, Power N. The appendix on CT. Clin Radiol. 2009 Feb. 64(2):190-9. [Medline]. Repplinger MD, Weber AC, Pickhardt PJ, Rajamanickam VP, Svenson JE, Ehlenbach WJ, et al. Trends in the Use of Medical Imaging to Diagnose Appendicitis at an Academic Medical Center. J Am Coll Radiol. 2016 Apr 2. [Medline]. Pickhardt PJ, Lawrence EM, Pooler BD, Bruce RJ. Diagnostic performance of multidetector computed tomography for suspected acute appendicitis. Ann Intern Med. 2011 Jun 21. 154(12):789-96. [Medline]. Hof KH, Krestin GP, Steijerberg EW, Bonjer HJ, Lange JF, Becking WB, et al. Interobserver variability in CT scan interpretation for suspected acute appendicitis. Emerg Med J. 2009 Feb. 26(2):92-94. [Medline]. Tamburrini S, Brunetti A, Brown M, Sirlin C, Casola G. Acute appendicitis: diagnostic value of nonenhanced CT with selective use of contrast in routine clinical settings. Eur Radiol. Dec 16, 2006 [Epub ahead of print]. [Medline]. Balthazar EJ, Birnbaum BA, Yee J, et al. Acute appendicitis: CT and US correlation in 100 patients. Radiology. 1994 Jan. 190(1):31-5. [Medline]. Rao PM. Technical and interpretative pitfalls of appendiceal CT imaging. AJR Am J Roentgenol. 1998 Aug. 171(2):419-25. [Medline]. Rao PM, Wittenberg J, McDowell RK, Rhea JT, Novelline RA. Appendicitis: use of arrowhead sign for diagnosis at CT. Radiology. 1997 Feb. 202(2):363-6. [Medline]. Rao PM, Feltmate CM, Rhea JT, et al. Helical computed tomography in differentiating appendicitis and acute gynecologic conditions. Obstet Gynecol. 1999 Mar. 93(3):417-21. [Medline]. Rao PM, Rhea JT, Novelline RA. Sensitivity and specificity of the individual CT signs of appendicitis: experience with 200 helical appendiceal CT examinations. J Comput Assist Tomogr. 1997 Sep-Oct. 21(5):686-92. [Medline]. Rao PM, Rhea JT, Novelline RA, et al. Helical CT combined with contrast material administered only through the colon for imaging of suspected appendicitis. AJR Am J Roentgenol. 1997 Nov. 169(5):1275-80. [Medline]. Sivit CJ, Applegate KE, Berlin SC, et al. Evaluation of suspected appendicitis in children and young adults: helical CT. Radiology. 2000 Aug. 216(2):430-3. [Medline]. [Full Text]. Malone AJ Jr, Wolf CR, Malmed AS, Melliere BF. Diagnosis of acute appendicitis: value of unenhanced CT. AJR Am J Roentgenol. 1993 Apr. 160(4):763-6. [Medline]. Lane MJ, Katz DS, Ross BA, et al. Unenhanced helical CT for suspected acute appendicitis. AJR Am J Roentgenol. 1997 Feb. 168(2):405-9. [Medline]. Lane MJ, Liu DM, Huynh MD, Jeffrey RB Jr, Mindelzun RE, Katz DS. Suspected acute appendicitis: nonenhanced helical CT in 300 consecutive patients. Radiology. 1999 Nov. 213(2):341-6. [Medline]. Ege G, Akman H, Sahin A, Bugra D, Kuzucu K. Diagnostic value of unenhanced helical CT in adult patients with suspected acute appendicitis. Br J Radiol. 2002 Sep. 75(897):721-5. [Medline]. in't Hof KH, van Lankeren W, Krestin GP, Bonjer HJ, Lange JF, Becking WB. Surgical validation of unenhanced helical computed tomography in acute appendicitis. Br J Surg. 2004 Dec. 91(12):1641-5. [Medline]. Ashraf K, Ashraf O, Bari V, Rafique MZ, Usman MU, Chisti I. Role of focused appendiceal computed tomography in clinically equivocal acute appendicitis. J Pak Med Assoc. 2006 May. 56(5):200-3. [Medline]. Kaiser S, Finnbogason T, Jorulf HK, Söderman E, Frenckner B. Suspected appendicitis in children: diagnosis with contrast-enhanced versus nonenhanced Helical CT. Radiology. 2004 May. 231(2):427-33. [Medline]. Hoecker CC, Billman GF. The utility of unenhanced computed tomography in appendicitis in children. J Emerg Med. 2005 May. 28(4):415-21. [Medline]. Mun S, Ernst RD, Chen K, Oto A, Shah S, Mileski WJ. Rapid CT diagnosis of acute appendicitis with IV contrast material. Emerg Radiol. 2006 Mar. 12(3):99-102. [Medline]. Iwahashi N, Kitagawa Y, Mayumi T, Kohno H. Intravenous contrast-enhanced computed tomography in the diagnosis of acute appendicitis. World J Surg. 2005 Jan. 29(1):83-7. [Medline]. Anderson BA, Salem L, Flum DR. A systematic review of whether oral contrast is necessary for the computed tomography diagnosis of appendicitis in adults. Am J Surg. 2005 Sep. 190(3):474-8. [Medline]. Xiong B, Zhong B, Li Z, Zhou F, Hu R, Feng Z, et al. Diagnostic Accuracy of Noncontrast CT in Detecting Acute Appendicitis: A Meta-analysis of Prospective Studies. Am Surg. 2015 Jun. 81 (6):626-9. [Medline]. Incesu L, Coskun A, Selcuk MB, et al. Acute appendicitis: MR imaging and sonographic correlation. AJR Am J Roentgenol. 1997 Mar. 168(3):669-74. [Medline]. Hormann M, Paya K, Eibenberger K, et al. MR imaging in children with nonperforated acute appendicitis: value of unenhanced MR imaging in sonographically selected cases. AJR Am J Roentgenol. 1998 Aug. 171(2):467-70. [Medline]. Duke E, Kalb B, Arif-Tiwari H, Daye ZJ, Gilbertson-Dahdal D, Keim SM, et al. A Systematic Review and Meta-Analysis of Diagnostic Performance of MRI for Evaluation of Acute Appendicitis. AJR Am J Roentgenol. 2016 Mar. 206 (3):508-17. [Medline]. Pedrosa I, Levine D, Eyvazzadeh AD, Siewert B, Ngo L, Rofsky NM. MR imaging evaluation of acute appendicitis in pregnancy. Radiology. 2006 Mar. 238(3):891-9. [Medline]. Burke LM, Bashir MR, Miller FH, Siegelman ES, Brown M, Alobaidy M, et al. Magnetic resonance imaging of acute appendicitis in pregnancy: a 5-year multiinstitutional study. Am J Obstet Gynecol. 2015 Jul 26. [Medline]. Cobben L, Groot I, Kingma L, Coerkamp E, Puylaert J, Blickman J. A simple MRI protocol in patients with clinically suspected appendicitis: results in 138 patients and effect on outcome of appendectomy. Eur Radiol. 2009 Jan 10. [Medline]. Gracey D, McClure MJ. The impact of ultrasound in suspected acute appendicitis. Clin Radiol. 2007 Jun. 62(6):573-8. [Medline]. Jang KM, Lee K, Kim MJ, Yoon HS, Jeon EY, Koh SH, et al. What is the complementary role of ultrasound evaluation in the diagnosis of acute appendicitis after CT?. Eur J Radiol. 2009 Jan 12. [Medline]. Wan MJ, Krahn M, Ungar WJ, Caku E, Sung L, Medina LS, et al. Acute Appendicitis in Young Children: Cost-effectiveness of US versus CT in Diagnosis--A Markov Decision Analytic Model. Radiology. 2008 Dec 19. [Medline]. Puylaert JB. Acute appendicitis: US evaluation using graded compression. Radiology. 1986 Feb. 158(2):355-60. [Medline]. Krishnamoorthi R, Ramarajan N, Wang NE, Newman B, Rubesova E, Mueller CM, et al. Effectiveness of a staged US and CT protocol for the diagnosis of pediatric appendicitis: reducing radiation exposure in the age of ALARA. Radiology. 2011 Apr. 259(1):231-9. [Medline]. Poortman P, Oostvogel HJ, Bosma E, et al. Improving diagnosis of acute appendicitis: results of a diagnostic pathway with standard use of ultrasonography followed by selective use of CT. J Am Coll Surg. 2009 Mar. 208(3):434-41. [Medline]. Mallin M, Craven P, Ockerse P, Steenblik J, Forbes B, Boehm K, et al. Diagnosis of appendicitis by bedside ultrasound in the ED. Am J Emerg Med. 2015 Mar. 33 (3):430-2. [Medline]. Tatli F, Ekici U, Kanlioz M, Gozeneli O, Uzunkoy A, Yucel Y, et al. Ultrasonography in diagnosis of acute appendicitis. Ann Ital Chir. 2016. 87:152-4. [Medline]. Mostbeck G, Adam EJ, Nielsen MB, Claudon M, Clevert D, Nicolau C, et al. How to diagnose acute appendicitis: ultrasound first. Insights Imaging. 2016 Apr. 7 (2):255-63. [Medline]. Quillin SP, Siegel MJ. Appendicitis: efficacy of color Doppler sonography. Radiology. 1994 May. 191(2):557-60. [Medline]. Patriquin HB, Garcier JM, Lafortune M, et al. Appendicitis in children and young adults: Doppler sonographic-pathologic correlation. AJR Am J Roentgenol. 1996 Mar. 166(3):629-33. [Medline]. Rettenbacher T, Hollerweger A, Macheiner P, et al. Outer diameter of the vermiform appendix as a sign of acute appendicitis: evaluation at US. Radiology. 2001 Mar. 218(3):757-62. [Medline]. [Full Text]. Tzanakis NE, Efstathiou SP, Danulidis K, Rallis GE, Tsioulos DI, Chatzivasiliou A. A new approach to accurate diagnosis of acute appendicitis. World J Surg. 2005 Sep. 29(9):1151-6, discussion 1157. [Medline]. Navarro DA, Weber PM, Kang IY, dos Remedios LV, Jasko IA, Sawicki JE. Indium-111 leukocyte imaging in appendicitis. AJR Am J Roentgenol. 1987 Apr. 148(4):733-6. [Medline]. Kipper SL. The role of radiolabeled leukocyte imaging in the management of patients with acute appendicitis. Q J Nucl Med. 1999 Mar. 43(1):83-92. [Medline]. Henneman PL, Marcus CS, Butler JA, Freedland ES, Wilson SE, Rothstein RJ. Appendicitis: evaluation by Tc-99m leukocyte scan. Ann Emerg Med. 1988 Feb. 17(2):111-6. [Medline]. Varoglu E, Polat KY, Tastekin G, Akçay F, Polat C. Diagnostic value of Tc-99m HIG scintigraphy in the detection of acute appendicitis. Clin Nucl Med. 1996 Aug. 21(8):645-7. [Medline]. Appendicitis in a young physician; computed tomography (CT) study. Intravenous (IV) contrast was administered to the patient, who had gram-negative sepsis but no abdominal pain on examination. Left, an inconclusive CT scan after administration of oral contrast but no IV contrast. Right, a repeat CT scan study following administration of IV contrast demonstrates the thickened, enhanced appendiceal wall and periappendiceal changes. The retrocecal location of the appendix may have attenuated abdominal symptoms. Normal appendix; barium enema radiographic examination. A complete contrast-filled appendix is observed (arrows), which effectively excludes the diagnosis of appendicitis. Normal appendix; computed tomography (CT) scan. A normal appendix, visualized here at the base of the cecum (arrow), is observed in 44-51% of patients. Thin-section CT scans (5-mm collimation or less) are more useful in identifying the appendix. Oral or rectal contrast should be administered. Intravenous contrast is useful in enabling enhancement and edema of the appendiceal wall to be identified. Distal appendicitis; computed tomography scan. The appendiceal lumen may be normal proximally (left, arrow), but distension and inflammatory changes are noted distally (right, open arrow). 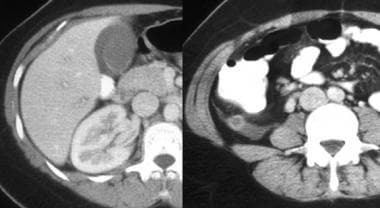 Retrocecal appendix; computed tomography scan. Left, the appendix occurs in a retrocecal location in 65% of patients. Right, in this young female, the appendix extends cranially as far as the posterior lobe of the liver. Appendicitis in a patient with a retrocecal appendix may present atypically, with less or poorly localized pain, discomfort on coughing or walking, or flank, rather than right lower quadrant, tenderness. Arrowhead sign; computed tomography scan. The presence of this sign indicates contrast outlining the cecum and funneling into the origin of the appendix, with obstruction of the lumen preventing retrograde flow of barium into the distal appendix. Acute gangrenous appendicitis with calcified appendicolith; computed tomography (CT) scan. A calcified appendicolith in the lumen of an enlarged inflamed appendix is shown. Perforated appendicitis with abscess; computed tomography scan. Note the appendicolith (arrow) and air within the abscess. The terminal ileum lies anterior to the appendiceal abscess, and inflammatory change is noted in its wall, which appears thickened (open arrow). Crohn disease in a young woman; computed tomography scan. The patient presented with acute right lower quadrant pain and fever. She had a normal-appearing appendix, but thickening of the wall of the terminal ileum was noted (arrow) in addition to sclerotic changes of both sacroiliac joints, that was consistent with sacroiliitis in association with Crohn disease. Severe acute pancreatitis in a young man; computed tomography scans. The patient presented with peripancreatic effusions that resulted in right lower quadrant pain. Fluid had tracked down the right paracolic gutter (left, arrow, coronal section) in addition to the anterior pararenal space (right, axial view). Acute suppurative appendicitis; contrast-enhanced, fat-suppressed, T1-weighted, spin-echo axial magnetic resonance image. A markedly enhanced and thickened inflamed appendix (arrows) is shown. a = iliac artery; c = cecum; p = psoas muscle; v = iliac vein. Normal appendix; contrast-enhanced, fat-suppressed, T1-weighted, spin-echo coronal magnetic resonance image. Mild enhancement in the unenlarged appendix, ileum (arrowhead), and cecum is shown. Normal appendix; longitudinal ultrasonogram. A compressible tubular appendiceal structure with an outer diameter of less than 6 mm (arrows) is shown. A = iliac artery; V = iliac vein. Suppurative appendicitis in a 15-year-old boy; longitudinal ultrasonogram. An aperistaltic, noncompressible, blind-ended, fluid-filled, tubular appendiceal structure is shown, and distinct wall layers (arrows) arising from the base of the cecum are observed. Phlegmonous appendicitis; oblique-axial ultrasonogram. A pericecal fluid collection, which is walled off by small-bowel loops (arrowheads) is shown, and an appendicolith with an acoustic shadow (arrow) is observed. Suppurative appendicitis in a 15-year-old boy; longitudinal view, pathologic specimen. An inflamed appendix with appendicoliths in the lumen (arrow) is demonstrated. Gangrenous appendicitis; longitudinal ultrasonogram. A markedly distended appendix (arrows), loss of mucosa and submucosal layers, and prominent echogenic pericecal fat are shown. Distended gangrenous appendix; pathologic specimen. Perforated appendix; longitudinal ultrasonogram. 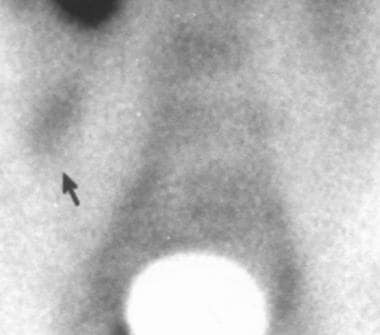 A defect on the tip (large arrow, right side) of the enlarged appendix (short arrows, left side) is observed. c = cecum. Periappendiceal abscess formation; oblique-axial ultrasonogram. 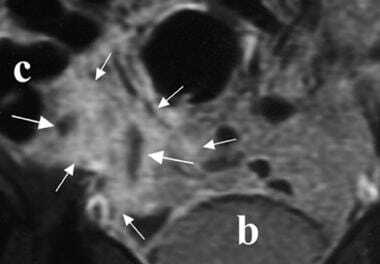 A thick-walled, complex, hypoechoic mass adjacent to the cecum (arrows) is shown. The inflamed appendix was not visualized. Computed tomography scan reveals an enlarged appendix with thickened walls, which do not fill with colonic contrast agent, lying adjacent to the right psoas muscle.